We’re bringing the concept of #VideoTag to LinkedIn. What's #VideoTag, you ask? It's an online adaptation of the old schoolyard game. In short, you record a video of yourself, upload it to LinkedIn and tag others to respond. It’s a fun, easy way to spur conversation online by showing your personality and lending your perspective on a topic of your choice. All it takes is a camera, a LinkedIn account and a topic that sparks your curiosity. #VideoTag has also inspired spinoffs. 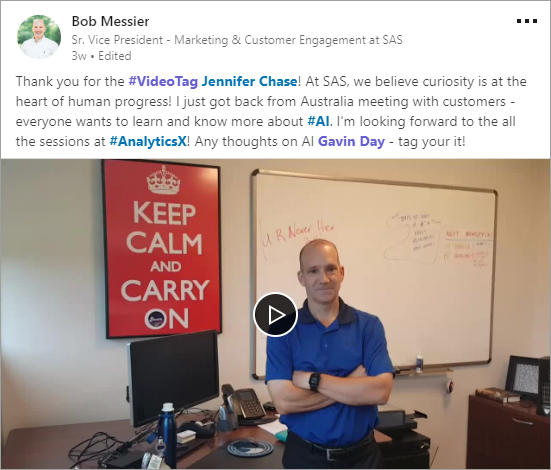 After receiving positive reactions to his original #VideoTag post, Bob Messier, Senior Vice President of Marketing & Customer Engagement at SAS, decided to create a separate video series on AI. 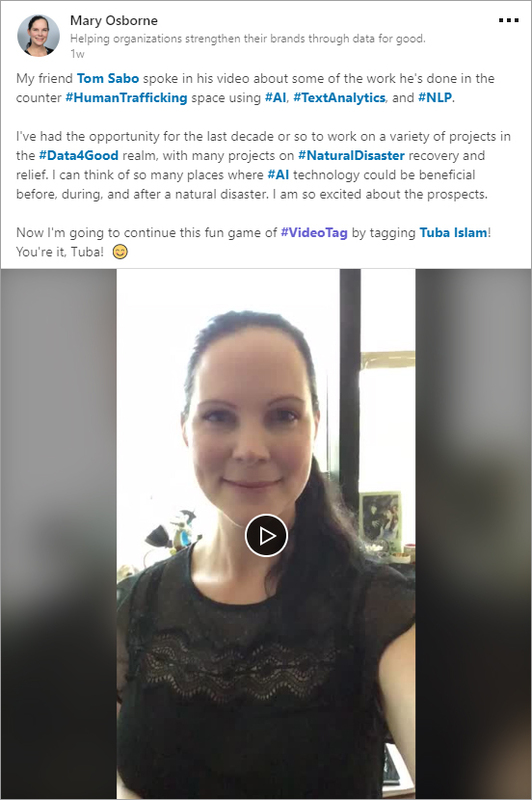 #VideoTag is a great way to connect and engage with your network. LinkedIn gave members the ability to upload video content just last year. Within weeks, numbers showed that videos got 20 times more shares than other forms of content on the social platform. This means you have even greater potential to reach more folks with your message. Second, #VideoTag is a powerful way to showcase what’s important to you. 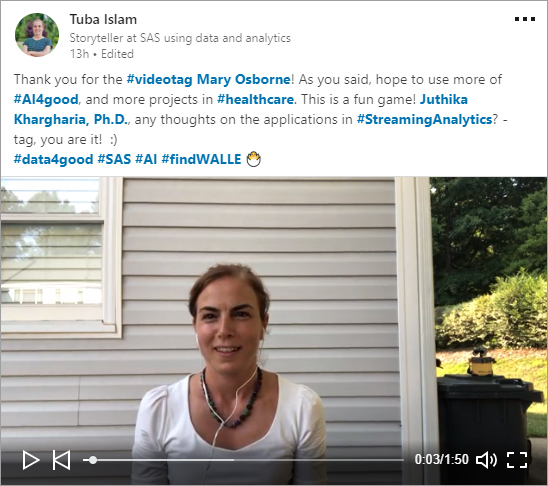 For some examples, check out the videos below, where SAS employees demonstrated their passion for innovation and eagerness to explore the impact of analytics on topics they care about. Whether it’s enabling smart cities, addressing the opioid crisis or using artificial intelligence in health care, our hope is that #VideoTag will spur more ideas and responses on an even wider range of issues. Everyone is invited to take part in the conversation – this is only the start. We’re all inquisitive beings and are interested to see what path your curiosity takes. Pull out your mobile phone or camera and add your voice to the thread! Here are a few helpful tips as you get started. Make it candid. This is a chance to connect with your viewers. Avoid making it overly produced or too self-promotional. Watch the length. The shorter your video, the more likely viewers will watch to the end. Choose a view and stick with it. Go with horizontal (or vertical) orientation from start to finish. Tag someone in your post. When you upload the video to LinkedIn, remember to mention a name (or two) of someone you’d like to see respond. Include the hashtag in your post so it appears in the #VideoTag thread. To keep feeding your curiosity, join us at Analytics Experience in San Diego in September or Milan in October. During the three-day conferences, you’ll discover how a mixture of analytics, technology and collaboration can turn your curiosity into possibility. 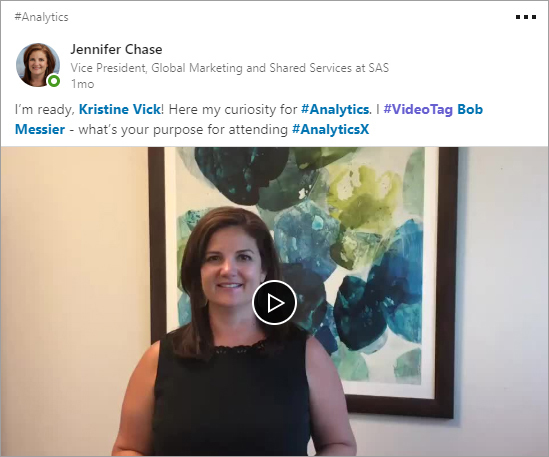 Jennifer Chase on what's in store at Analytics Experience. Stephen Kearney, a.k.a. 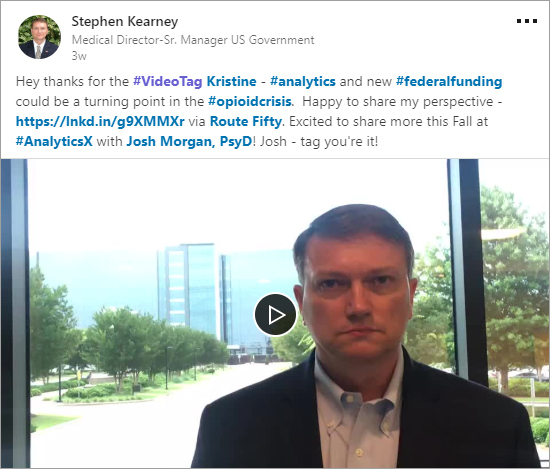 "Dr. K," on analytics in public health. 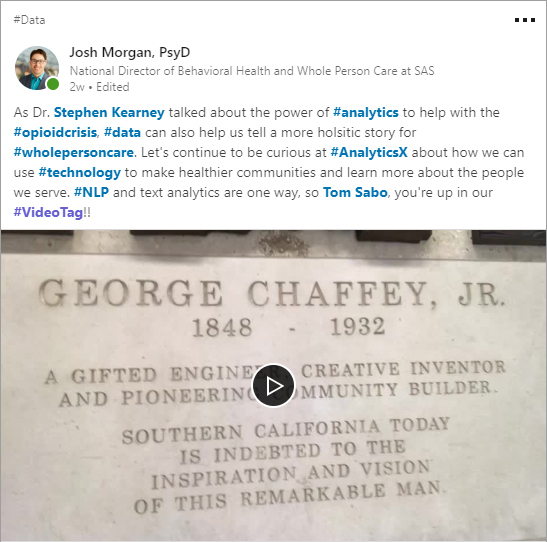 Josh Morgan on using analytics to make healthier people and communities. Mary Osborne on the possibilities of using artificial intelligence (AI) and data for good in humanitarian efforts. 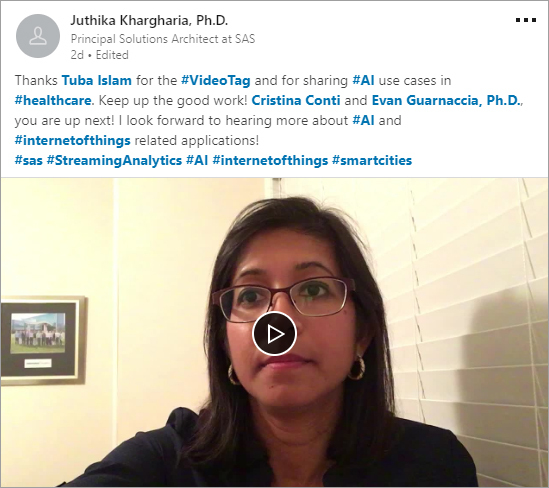 Tuba Islam on a recent AI project with a health care device manufacturer. Juthika Khargharia on a recent Internet of Things use case. 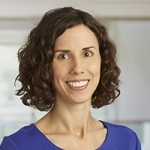 Lindsay Beth Gunter specializes in creating and executing communication, content and social media strategies for senior executives at SAS. She further blends social media and business as the communications counterpart for the company’s global social selling program. In her spare time, she enjoys volunteering in support of local causes and laughing at the shenanigans of her two young sons.